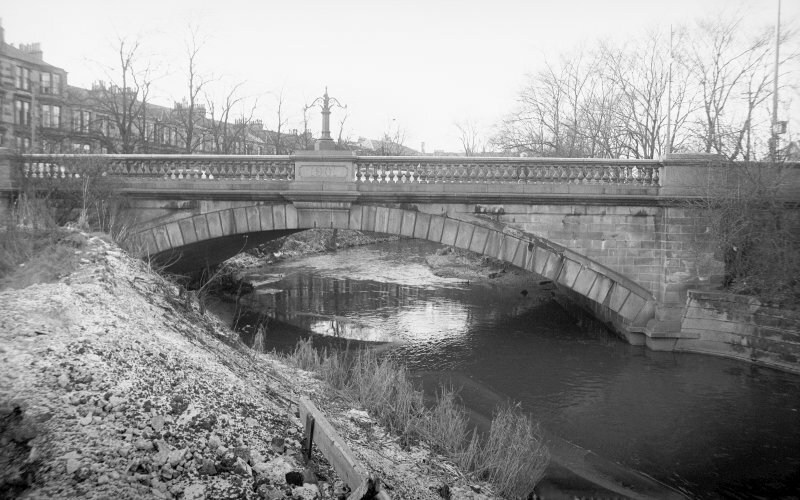 Scope and Content New Bridge, Holmlea Road, Glasgow This single-span masonry arch bridge was built in 1900-02, to replace an earlier hump-backed structure, over the White Cart Water. It was part of a major road-improvement scheme to bring electric tram services to Cathcart and Netherlee. This shows the flat single-segmental span, faced in red sandstone, with polished red granite balustraded parapet. The White Cart is liable to sudden spates, hence the size of the water way. Behind the bridge are tenements built to accommodate workers in G & J Weir's Holm Foundry. The construction of the Cathcart District Railway, opened in 1886 and completed as the Cathcart Circle, and of the electric tramway had turned Cathcart from a quiet, old-fashioned estate and mill village into a busy industrial and residential suburb of Glasgow by 1914. Source: RCAHMS contribution to SCRAN.